Cinnamon comes from the inner bark of tress native to South east Asia, China and India, the trees all come from the Cinnamomum genus. To obtain the cinnamon, the tree is first grown for two years, then it is coppiced. Then sometime in the next year around a dozen shoots will come from the roots. When this is done the outer bark is scraped of the branch and the branch will be beaten to make the inner branch loose. It is then made into long rolls. In Traditional Chinese medicine the twig is used, it is called Gui Zhi and it used for ailments such as flu, colds and used in conjunction with other herbs for body aches and joint pains. In Ayurveda the bark is used for digestion, destroying toxins, arthritis, raynauds syndrome and dysmanerreah. It is used sometimes in combination with ginger, cardamom and Indian bay leaf. Cinnamon is also used as an essential oil. 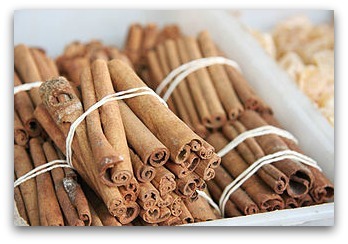 A substance in cinnamon known as CEppt inhibited the growth of Alzheimer's in mice. Cinnamomum cassia has been shown in tests to be effective against HIV1 and HIV2. In a study published by the Journal of agricultural and food chemistry, cinnamon demonstrated antibacterial activity against five types of food bacteria. Researchers in Iran tested a water based cinnamon extract on leukemia infected cells, it was succesful in inhibted the leukemia activity. The researchers concluded that would recommend using it as a single drug or with other medications to treat promyelocytic leukemia. Iranian researchers tested sixty healthy female athletes aged between 13 to 25 for six weeks and put them in three groups. They received 3 grams of cinnamon, ginger or placebo. The results show that there was a decrease in muscle soreness in the cinnamon and ginger group. Cassia cinnamon contains a substance called coumarin. Warfarin is a drug used to stop blood clotting and it comes from coumarin. The German Federal Institute for Risk Assessment in 2006 warned against ingesting large quantiles of cassia cinnamon.